Turkish Prime Minister's latest slur claims Israel 'has surpassed Hitler in barbarism' - hours after ADL demands crackdown on anti-Semitism. Turkish Prime Minister Recep Tayyip Erdogan on Saturday launched a fresh virulent attack against Israel over its actions in Gaza, comparing the mentality of some in the Jewish state to Adolf Hitler. Erdogan, who portrays himself as the global Muslim leader who speaks up for Palestinian rights, has intensified his rhetoric against Israel over its actions in Gaza, ahead of an August 10 presidential election in Turkey. "(Israelis) have no conscience, no honor, no pride. They curse Hitler day and night, but they have surpassed Hitler in barbarism," Erdogan told supporters at a campaign rally in the Black Sea city of Ordu. The statements follow Israel's decision to pull diplomatic staff from its embassies in Ankara and Istanbul, after violent riots there Thursday night resulted in injuries and damage. Israel has linked the violence to a number of inflammatory and anti-Semitic hate slurs from Turkish Prime Minister Recep Tayyip Erdogan, who has become increasingly vocal against Israel after the IDF moved to protect millions of Israelis from Hamas rocket fire. Erdogan has threatened to end the normalization process with Israel over "state terrorism" before, and also accused Israel of "lies" because "not enough" Israeli Jews have died in the conflict. "They say (Hamas) is firing rockets. But is there anybody who died?" he asked. "The number of Palestinians that you (Israel) killed is now 100. Their (Israel's) life is based on lies." "You will first stop this oppression. 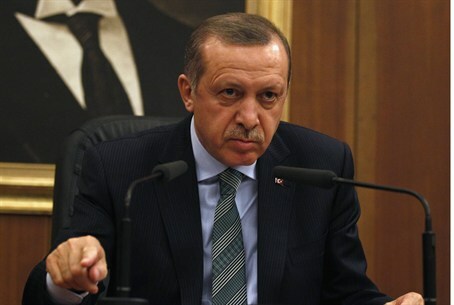 If not, it is not possible to realize normalization between Turkey and Israel," Erdogan said, on a separate occasion. On Thursday night, he claimed Israel had a long history of "genocide" against Muslims, in a series of confused and violent slurs relating to the Ramadan fast. "This is not the first time we have been confronted by such situations," Erdogan told a meeting of Islamic scholars gathered in Istanbul for Ramadan, a holy month of fasting for Muslims. "Since (the creation of the state of Israel) in 1948 we have been witnessing this attempt at systematic genocide every day and every month. But above all we are witnessing this attempt at systematic genocide every Ramadan." Earlier Saturday, the Anti-Defamation League called out Erdogan on the string of anti-Semitic comments, demanding that he stop his anti-Israel tirade and crack down on anti-Semitism in the Turkish media.